WILLEMSTAD - The current Minister of Traffic and Transportation (Jesus-Leito) and Minister of Economic Development (Steven Martina) are continuing the biased attitude of the government towards Ava Airways Curacao that was instituted by the previous Minister of Traffic and Transportation, Camelia-Römer. Ava Airways Curacao recalls that Camelia-Romer did all that was required to fight Ava Airways Curacao, so that the privately held company InselAir could linger on in mere existence by the sake of public funds of the Curacao community. Ava Airways Curacao recalls her involvement in the e-mail scandal in connection with InselAir’s management e-mail to Camelia-Romer, dated May 18, 2015, ordering her, as minister, to deny Ava Airways Curacao its economic permit. 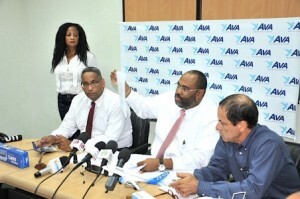 Ava Airways Curacao has filed a criminal complaint against Camelia-Romer and InselAir and its management. Until today, the public prosecutor of the same government has not investigated and prosecuted Insel Air, its management and Camelia-Romer in connection with this public corruption involving the misuse of government powers by Camelia-Romer. The same government and Camelia-Romer, that had involved and instructed the Central Bank of Curacao and Sint Maarten to advise Camelia-Romer to extort Ava Airways Curacao by demanding that an irrevocable and unconditional letter of credit, to the tune of, USD 48.9 million, be posed by Ava Airways Curacao in favor of the government, as a condition for Ava Airways Curacao to obtain a simple economic aviation permit. It is also obvious to Ava Airways Curacao why just Etienne Ys, who, at present, happens to be the president of the supervisory board of this same Central Bank, was handpicked by Camelia-Romer to also be the “fixer” as the president of a committee of supposedly wise men to advise her to have the government grant an actually irrecoverable “loan” to the tune of ANG 33.000.000, followed by an additional, also irrecoverable, “loan” of a government controlled entity of ANG 2.7 million, i.e. a total of, approximately, ANG 36.000.000, to the technically bankrupt InselAir. Loans out of public funds that will never be repaid by InselAir. The same Etienne Ys, who, while president supervisory director of the Central Bank and, apparently, the only wise man in aviation matters in Curacao, is meddling in the privately owned InselAir by now seeking third party financing by a One Laser Group, LLC from Miami for the financially completely bankrupt Inselair, in order to ward off its immediate demise of InselAir in August coming. Why is InselAir not being required today to post an irrevocable and unconditional guarantee or letter of credit to the tune of USD $48.9 million. This constitutes a violation of all practices recommended by ICAO and trade agreement Curacao has sign with other countries to promote competition in air services in a level playing field for all involved. In the meantime, Ava Airways Curacao is still waiting for its day in court in the matter of its challenge of the legality of the refusal by Camelia-Romer and Jesus-Leito of the economic license requested by Ava Airways Curacao. Additionally, Ava Airways Curacao will take steps to sue both the government and InselAir for all its damages as a result of the criminal conspiracy between InselAir and the government of Camelia-Romer and Jesus-Leito to not grant the economic license to Ava Airways Curacao. Ava Airways Curacao shall start by addressing the Common Court of Justice to order the public prosecutor to investigate and prosecute InselAir and its management and Camelia-Romer in connection with their public corruption involving the misuse of government powers by Camelia-Romer as a minister. Due to these disasters for Curacao the aviation sector in Curacao is bankrupt. They have caused serious damage to the economy and credibility of Curacao and its government in general and its aviation and Ava Airways Curacao in particular. They are the sole reason why Curacao is still stuck for over 8 years now in IASA FAA’s category 2 safety rating.